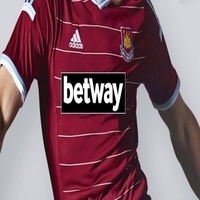 Betway are offering amazing ongoing promotions during The Cheltenham Festival. Do not miss out on this fantastic opportunity. The Cheltenham Festival second place finish money back special is a must for all you horse racing punters. 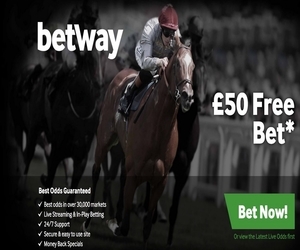 You also have the benefit of the backup insurance bet (horse racing faller money back special) knowing that if your horse falls, Betway will refund your losing bets with a FREE Bet equal to your stake up to £50. Place a Race Winner bet on the first race of any day in the Cheltenham Festival, and if your horse finishes second, we’ll refund losing bets with a Free Bet equal to your stake up to £50. 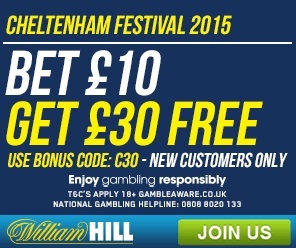 Check out the amazing offers below that Winner Sports are offering on a daily basis during The Cheltenham Festival. 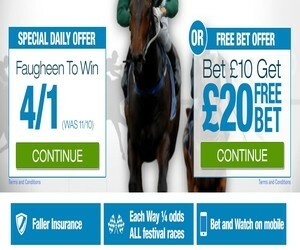 Be sure not to miss out on these fantastic odds and ongoing promotions. Winner Sports are becoming more and more popular in the online sports betting industry and with offers like these we can see why their punters are benefiting. Winner Sports are offering an amazing Money back if your selection scores 275+ but fails to win the game throughout the whole of the Cricket World Cup. All you need to do is just bet on a match and if the selection scores 275+ but fails to win they will manually credit your money back (T&Cs apply). 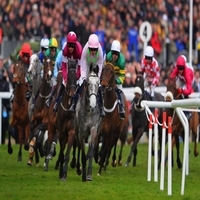 We are very pleased to share with you details of Betfairs Road To Cheltenham promotion. This free virtual game, open to new and existing customers, will give everyone a chance to win VIP tickets to Cheltenham festival or a free bonus on each of our gaming products. If you are not lucky enough to win ticket other prizes include, free spins on casino and arcade, free tournament tokens on poker or £5 free bingo tokens. Best of all, customers can play everyday between now and 1st March. Just 20 days now until the Cheltenham Festival and we are starting the countdown today with a great enhanced treble for the Supreme, Arkle and Champion Hurdle which is being bumped up from 15/1 to 20/1 – just for today! We will have a daily enhancement now until the festival which we will try get out to you as soon as we can.